If you’re looking for a sliding screen door replacement, you’ve probably figured out it isn’t the easiest thing to change out. There are too many factors at play making a broken sliding screen door fit and work as it once did. Fortunately, there are some alternatives to help you replace your sliding screen door and get it working again. Chances are you use your sliding screen door a lot. In warm months your family makes frequent trips in and out of the house to the back yard. Your kids don’t treat the door with the utmost care (hey, they’re kids), and if you have pets, they too contribute to excessive wear and tear. And us adults… So many times, our hands are full so we slide doors open in awkward ways that are rough on the screen door’s frame and rollers. Over time, all this use (err…misuse and abuse!) adds up forcing you to replace your sliding screen door. Just buy a new screen door? Here’s the scoop: It’s not that simple. Well, as with most of the other doors in your house, no two openings (a door’s side and head jambs) are exactly the same dimensions. The deal is that size does matter or a door won’t operate properly. In this case, a slider won’t roll or close smoothly unless it’s just the right size and shape for its opening. You’ve probably experienced this if the sliding screen door you need to replace is bent and taken on some funny geometric shape – i.e., it’s not the perfect rectangle it once was! What does this mean? It means you need to find a replacement sliding screen door that is EXACTLY the size of your opening. While you can try and pick up a standard sliding screen door replacement at your local home center (IF they sell them), your odds of having it fit just right with your existing sliding door and track system are slim. Special order a replacement screen door? Ok, so if you can’t bank on any standard replacement screen slider to fit, then why not just special order a new one? Maybe you’re fine paying a few extra dollars for a custom-made door. Well, most window and door guys are not into selling you JUST the sliding screen door. It simply isn’t worth their time or effort. They are in the business of making and selling you the entire glass screen door and screen slider! Quite a bit more money for you AND them! So what are your options then if you can’t find a simple new screen door off the shelf and don’t want to spend hundreds of dollars? As it turns out, there is a pretty nifty alternative that you might actually like better. Not only is it less expensive and less of a hassle in the end, it provides even more convenience then a regular sliding screen door. The kind of conveniences you didn’t have before that most likely caused your last door to wear out and break. The Bug Off Instant Screen door is one of those genius ideas. So simple in design, and easy to install, i.e. there are NO TOOLS REQUIRED, so it doesn’t get any easier! Essentially, this is an innovative screen door replacement. It hangs right where your regular screen door would go and has a slit down the middle. The slit stays together using strong magnets on each side – but when you need to get by, the slit parts easily to let you walk through. 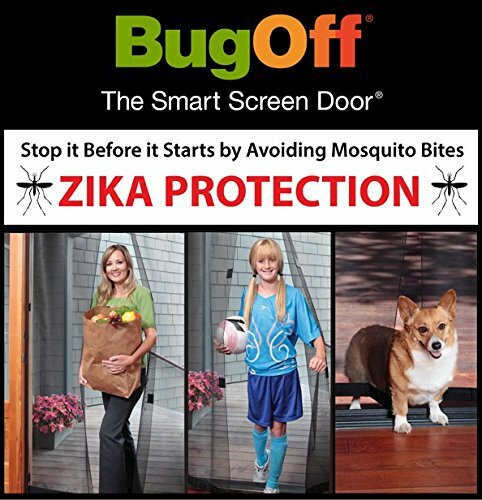 Once you’re past, the screen door swings automatically back in place, sealing the doorway to keep out bugs and insects. The result is you still get fresh air flowing in through your house, and you have a long-lasting “screen door” replacement. If you have pets, this setup works great as a doggy door. Your dog can just walk through the screen, and it snaps back in place. The screen is durable and will hold up for years, even with kids and dogs running through it over and over. Installation is nice in that you don’t have to drill anything or risk damage to your doorway. This means you can use this at an apartment or condo where you might not be allowed to have a rolling screen door. These cool replacement screen doors come in a bunch of sizes, so measure your doorway and get the one that fits. Hope for your current door? If you still prefer to replace your sliding screen door with a like one, then come to terms with spending the money. The solution above may not be for you, for example, if you prefer to actually keep pets inside while getting fresh air inside. Regardless, a new screen door will most likely require you to find a window shop/dealer to make or special order you one. Alternatively, you can reassess your damage and try to fix what you have. Unless your screen door has blown off to Neverland in a fierce windstorm or something, take a step back and see if you really need to replace your sliding screen door. Ask yourself if it’s at all possible to actually fix what you have. If the door’s frame needs repair see the following tips. Clean tarnished frames with aluminum cleaner or any all-purpose mild cleanser. It’s normal for aluminum to oxidize, and you can help this by applying some auto wax after you’ve cleaned it up to help it look new. If the frame is bent, you can try to straighten and realign things. First, you’ll need to remove the door and have a large flat surface available to work on. Using a measuring tape, you can get it square again. First, align one side to something that is level and true such as a wall or kitchen floor. Then measure from one corner to the other diagonally and do the same on the other two. Maneuver the sides around until the measurements are the same. Since the corners are probably loose, try attaching some angled brackets used for picture frames. For other repairs, see if you can hammer out dents and creases to make the frame straight again. If rollers are bent or broken, pick up replacement rollers at the hardware store. Be honest with yourself though as you look at making these repairs. It might just be worthwhile to get a complete sliding screen door replacement like the alternative mentioned above.